Sound travels through the air in the form of vibrations. These vibrations cause particles of air to compress together and this causes the air around them to move in such a way that they are driven in waves away from the source. 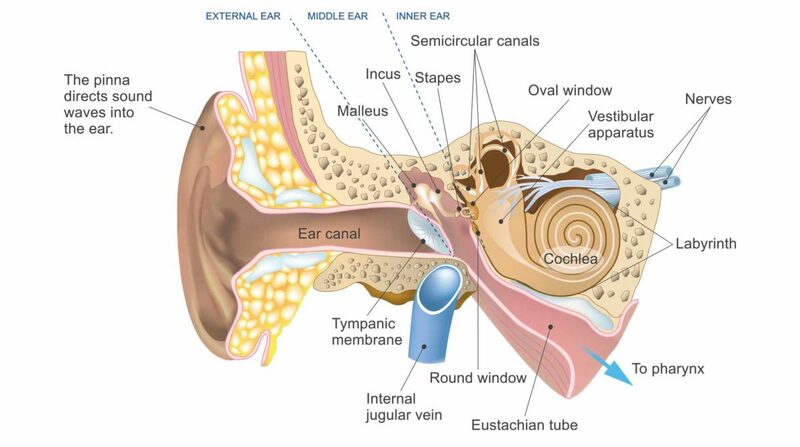 These sound waves are gathered by the outer ear and directed down the ear canal to the ear drum (tympanic membrane). The eardrum is a thin membrane that is stretched tight like a drum, separating the outer ear from the middle ear. The soundwaves cause the eardrum to vibrate. These vibrations move the three tiny bones (malleus, incus, stapes) in the middle ear. Those vibrations then pass through to the innermost part of the ear, which is called the cochlea. Within the cochlea are tiny hair cells surrounded by fluid. When the fluid reacts to the vibrations transmitted from the middle ear, the tiny cells send signals to the auditory nerve, which in turn transmits information to the brain. The brain then interprets those signals into meaningful sounds, such as speech.